The first commercial scale tidal turbine was positioned at Strangford Lough in Northern Ireland. Built in Belfast, the Sea Gen Turbine has a capacity of 1.2 megawatts and can generate enough electricity to power 1,140 homes. The SeaGen machine resembles an underwater windmill. 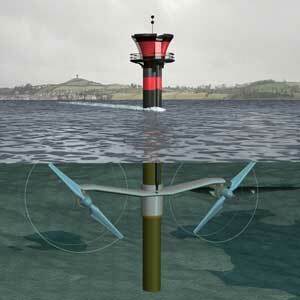 It features two underwater propellers attached to a tall column anchored to the seabed. SeaGen is being installed by Marine Current Turbines off Orkney and at a 100MW site north-west of John O'Groats.